How far would you go to reunite with your first love? Despite the struggles and hardships of early settlement days in Australia, Molly and Abel thrive in a wealth of love—until tragedy tears them apart. In the delightful sphere of Harmonia, Molly refuses to move to a higher spirit level, clinging to the hope of reuniting with Abel. She becomes an apprentice guardian angel but her playful nature creates havoc, resulting in the failure of her assignments. Devastated without her, Abel immerses himself in crime, gravitating toward the powers of darkness. With the help of her colourful—but flawed—spirit friends, Molly endeavours to guide him back to the light, back to her. Together and apart, as they cross the boundaries of life and death, Molly and Abel discover that no one escapes the consequences of karma. Is true love for eternity—or just a lifetime? Angel of Rosetown, previously published under the title of Moongolly is a thought-provoking story woven with original theories and concepts on the Afterlife and the Spiritual Hierarchy. *** Why do bad things happen to good people? *** How can time-travel make sense? *** Why am I here? Answers to these questions and other conundrums are embedded in the story of Moongolly – Angel of Rosetown. 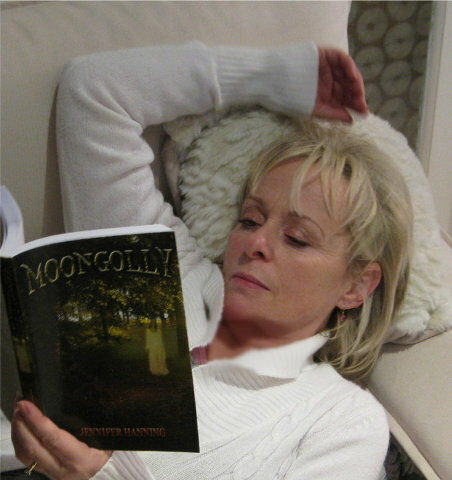 "Moongolly is two stories in one book and I enjoyed switching between Earth life and the spiritual world of Harmonia. This book is unique and will be looked upon as the answers for some and a charmingly interesting story for others. " Anna Anderson, Caulfield, VIC. "I loved developing an understanding of the hardships experienced by the early settlers to Australia and the contrasting joy and colour of the spirit world." Renee Olsen, Collingwood Park, QLD. "I loved, loved, loved Moongolly! A fabulous read exquisitely crafted with twists and turns woven through the story. I couldn't put it down. Jennifer's characters are brilliant, very colourful. She has a wonderful writing style—her understanding and obvious love of language comes through on every page. This is an imaginative novel that is enlightening, witty and a delight to read". Janice Sigley, Auckland, NZ. "I don't often read fiction, mainly books related to yoga, however I found myself reluctant to put Moongolly down. The soul connection and romance reminded me of my first love relationship which was also marred by impossible situations. I, too, would have followed him to the end of the Earth." Maya, Seaford, VIC. "Moongolly was so unbearably sad at one point that I was tempted not to read any further. I'm so glad I continued as overall, it is a very uplifting book. I finished the book a while back but almost every day something someone says, or a random thought comes into my head, that reminds of Moongolly. Ina Mae McCormack, Christchurch NZ.
" After reading Moongolly, I have no fear whatsoever of dying. I couldn't wait to get home from work every night to pick up my book and find out what would happen next." Tricia Egan, Prahran, VIC. "Although suitable for all ages, I feel that Moongolly would appeal to young girls in particular. It brought back such vivid memories of first love and the absolute belief that this love would last forever, no matter how impossible it might seem." Jules Dorian, Windsor, VIC. "Moongolly leaves me richer for having spent time with such charming characters. It is whimsical, fast-paced and well plotted. This book is sometimes sad, often uplifting, with a profound wisdom and a sense of spirituality that will intrigue this reader forever. Any chance of a sequel? I knew I was going to loath the time when I reached the last page and I was right. However, she will never collect dust on the bookshelf. I am ready to begin reading it again." Pauline Carelsen, Chicago, USA. "Loved this book and couldn’t put it down. I had no idea what was going to happen next and was dying to know (excuse the pun)" Bree Cotchin, Brighton, VIC. "Thanks so much for Moongolly. Couldn't put it down and I read it in record time. Loved it and looking forward to your next one." Luan Cox, Melbourne. "I thoroughly enjoyed the read and found the concepts thought-provoking and enlightening. I often find myself thinking about the sentiments and various events that happened throughout the book." Nicola Towler, Grose Vale, NSW. "Moongolly came to me at a time when I needed to escape … and I did. I was absolutely glued to this book and did not want it to end. A read I have recommended to others. Linda Wilton, Cheltenham, VIC. "I read your beautiful spiritual book and thoroughly enjoyed it... It really does make me think about things I normally wouldn't think about. So thank you." Sue-ella Payne, Perth, WA.
" This book is unlike anything I have ever read before. What a great concept for a storyline! The main characters take me back to the days of when my Grandparents were living, so it was easy to understand the conditions of living back then. I was sorry to see Molly's death come so quickly in their marriage. That made me sad, however, I loved reading the adventures of her in Harmonia, along with the other characters that Jennifer created there too. The only reason I am giving this a 4 star is because a lot of the book was sad. All the earth bound characters had very sad lives, and it made me sad to read of their lives. It was a great adventure, and I'll read her next book very soon." Karen99, Amazon US. "A gem of a book. It is the love story of Molly (aka Moongolly) and Abel, and is truly unique and very cleverly crafted. They first meet as tiny children but are separated for many years only to be reunited again, but only for a very short time until circumstances separate them once more. Molly is forced into another realm—Harmonia—and from that point on their story is told on two "planes", Molly in Harmonia and Abel still on Earth. It's a story of love, destiny and karma and is extremely well written with some wonderful characters, especially the friends Molly makes in Harmonia. An absolute joy to read, the words just flow off the page, or screen if you are a kindle reader, like me—and I would recommend this book to anyone." Elaine G, Amazon UK. "Fantastic book!!! After reading, What happened to Polly, I knew Jennifer Hanning was a good author. I started this book not knowing anything about it since I prefer to be surprised. It starts with Molly and Abel meeting at a young age in the 1800's. The story was great but then it really blew me away when Molly changed her name to Moongolly and went to Harmonia. This book will stay with me a long time and already has made me live my life better in hopes that there really is a place like Harmonia. It has love, war, heartbreak, pain, deep friendships and lessons on life mixed in a little paranormal/fantasy to make it a great story. One of my all time favourite books ever!" Maeflower, Shelfari by Amazon US. Jennifer Hanning has become one of my favorite Word Weavers. She takes a deep spiritual subject and presents it in a very entertaining and gripping storyline, presenting a deeper understanding and appreciation for Guardian Angels, Reincarnation and the "After Life" I highly recommend this book for anyone who likes a good read. Excellent ***** Roger Nobles, Texas, US. The book begins with the feel of a conventional romance. Molly and Abel are separated as very young children. Years later Molly is re-united with the love of her life, but suddenly the tale takes an unexpected turn and it becomes clear that this is a startlingly and refreshingly original book. We are treated to a delightful, whimsical vision of a multi-level, curiously high-tech hereafter. The book's impact lies in the contrast between the possible delights of that afterlife and the earthbound existence of characters who seem doomed to failure. The book is well-written, the language flowing in a way that carries the reader along without effort. I only hope that the author's vision of the hereafter is correct; I'm looking forward to it already – and I'm trying hard to spot my guardian angel. B.J. Burton, Amazon UK. Having lost two sisters at a young age and my parents two days apart, (at least they had a long life together), I spent an enormous amount of time pondering the afterlife. There were too many questions without answers and so I decided to write a book where everything made sense. Even time travel! Fortunately, the story seemed to write itself, the characters becoming my intimate friends. At one stage one of the characters started falling in love with the wrong person. I fought against her for a while but in the end I let her win. I'm glad—she was right. 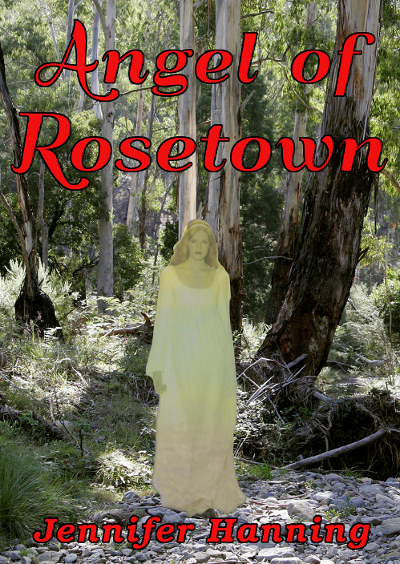 Angel of Rosetown is available in paperback and in digital format.